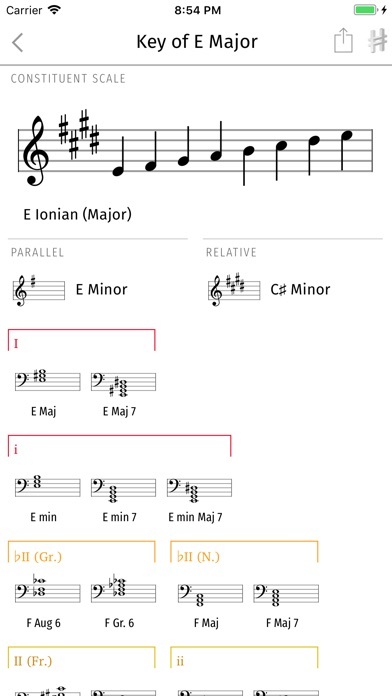 Harmonious is the exhaustive piano and guitar chord and scale app for students, composers, songwriters, arrangers, and working musicians. 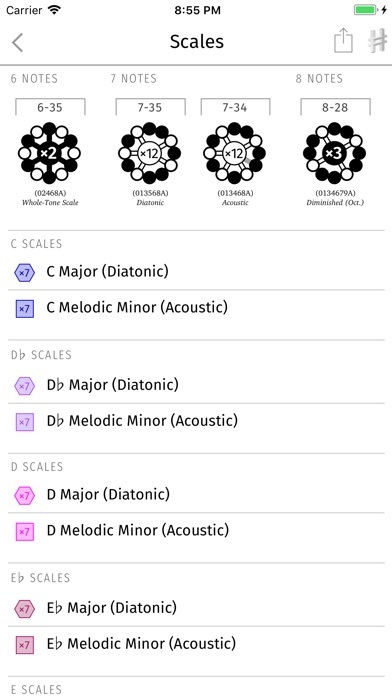 What if you could learn music theory from a mentor that had all the answers? Start with what you know and follow your curiosity, confident that you have all musical options at your disposal, since Harmonious is the most complete chord and scale map. Find extensions, substitutions and chromatic flavors that lie at the edge of the familiar and the exotic. See connections through the dual lens of chords and scales, linking harmony and melody. — Everything is connected! Tap to navigate and use the handy back button or index button to jump to different areas of the app with a few taps. 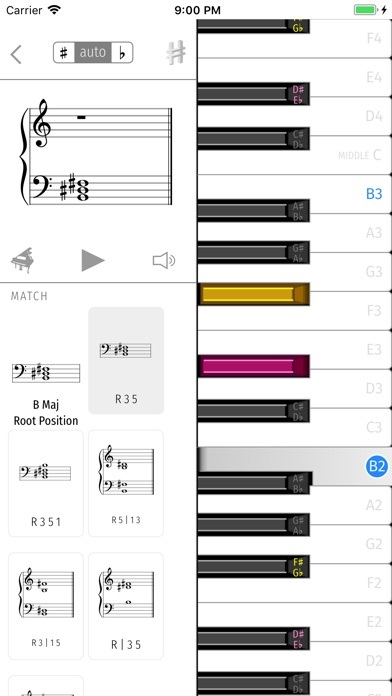 — Interactive piano search helps you determine how notes combine into chords and scales just by selecting notes. Tap a chord or scale to learn how to play it and more importantly, when to play it: its parent keys, modes or scales. 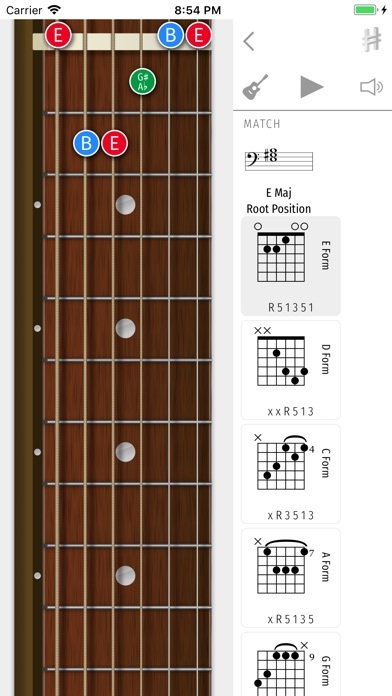 — Interactive fretboard search (guitar standard tuning) helps you determine what you are playing, where to play the same or similar things, and why the chord matters harmonically. 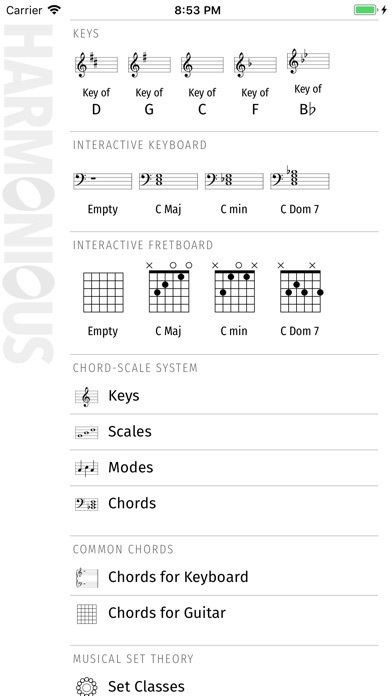 — Audio Feature: Hear chords and scales, and hear notes as you enter them. Toggle between multiple instruments, or mute to learn in silence. Press and hold anywhere to hear a chord or scale without navigating. 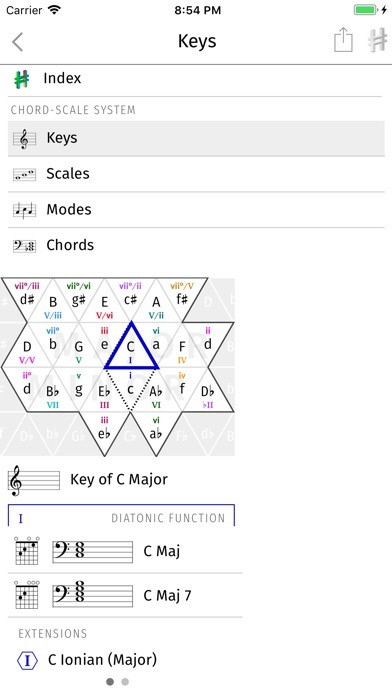 — An interactive circle of fifths reference includes all major and minor keys, showing you triads and seventh chord function with just a simple flick. Extensions (ninths, elevenths, thirteenths) are available as well, with just a tap. — Share what you learn with links to the website, so other musicians, or you yourself, can find the info later. Common approaches to music theory present an arbitrary subset of possible chords, scales, functions, or progressions (without explaining why they are favored) or present long (but incomplete!) lists of notation, jargon, and formulae to memorize, with no end in sight. There are in fact bounds to the number of meaningful relationships between musical objects, at least if we stick to 12-TET, and we can enumerate those relationships from first principles without fear of arbitrarily leaving something out, using the underlying mathematical structure to guide us through the space of possibilities. In addition to attempting to be as complete a reference as possible, Harmonious attempts to map out the richness and ambiguity inherent in harmony as precisely as possible.